Sugimoto, C.R. et Larivière, V. (2018). Measuring Research. What Everyone Needs to Know. Oxford : Oxford University Press. 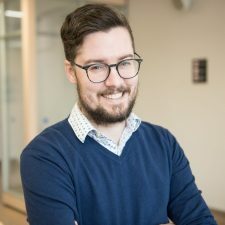 There is a wide set of data and tools available for measuring research, but they are often used in crude ways, and each have their own limitations and internal logics. 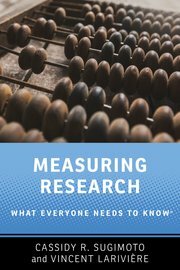 Measuring Research: What Everyone Needs to Know® will provide, for the first time, an accessible account of the methods used to gather and analyze data on research output and impact. Following a brief history of scholarly communication and its measurement — from traditional peer review to crowdsourced review on the social web — the book will look at the classification of knowledge and academic disciplines, the differences between citations and references, the role of peer review, national research evaluation exercises, the tools used to measure research, the many different types of measurement indicators, and how to measure interdisciplinarity. The book also addresses emerging issues within scholarly communication, including whether or not measurement promotes a « publish or perish » culture, fraud in research, or « citation cartels. » It will also look at the stakeholders behind these analytical tools, the adverse effects of these quantifications, and the future of research measurement. Mis à jour le 5 juillet 2018 à 14 h 12 min.